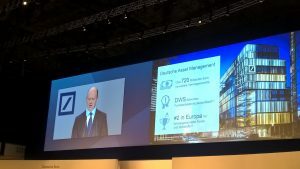 During today’s general meeting, investors critically questioned Deutsche Bank’s 2020 strategy. How does the proposed strategy look, and how convincing is it? The first pillar of the new strategy is the merger of Postbank and Deutsche Bank’s retail customer business. After the past back and forth with Postbank, and given the low margins of Postbank, this seems a bit dubious. But the decision has obvious attractions: 11 mn online customers and economies of scale in such a combined business. This will allow Deutsche Bank to give its flagging retail business the much-needed push. The strategy’s second pillar is a merger of the Corporate Finance Business and Capital Markets business. Jointly with the increasing focus on corporate clients, the objective for this change is clear: More cross-selling at the corporate level, thus lessening the competition’s comparative advantage at the international level. An interesting aside: Both Achleitner’s and Cryan’s speech stress Deutsche Bank’s focus on Europe and Germany. But Cryan took on responsibility for the US-business only two months ago – is such a focus of the CEO compatible with the geographic focus? The third pillar of the new pillar is the proposed IPO of Deutsche Asset Management. Most investors focussed their critical comments on this topic. The core brand DWS has been extremely profitable until last year (684mn EUR profit in 2015), bringing Deutsche Bank much-needed margins. Will the one-time capital injection generated through the IPO benefit Deutsche Bank more than keeping on this trusty cashflow generator? After all, DWS brought Deutsche Bank successfully through the recent economic storms.